Antax Lures are another great lure from serbia & this guy was taught all he knows by Jocko the maker of Yogis. 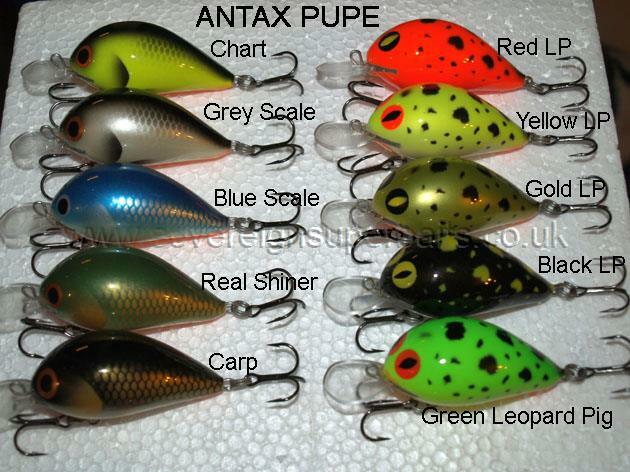 This model, the Pupe, is a long casting, rattling medium diver with a fantastic tight wiggling action that is almost mannic. lots of Zander, some very good Chub & just loads of pike on these. They are well balanced, beautifully finished, come in ten colours,5 in the natural range & 5 in the "leopard pig" range. They come in two sizes, both furnished with VMC 8649s (the short shank version of the 9649) in black chrome finish, which are secured by "Momerov" split rings, made in Serbia & one of the strongest ranges of split rings we have come across, used extensively throughout the Balkans. The large ones weigh 17gms & are 60mm in length. The smaller ones weigh 5gms & are 37mm in length.